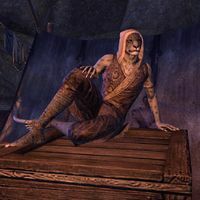 Masrabal-dro is a Khajiit brewer who runs Hidden Moon Brewing in Dune. When approached he says "People call this one a coward for not fighting. Ziss on them. Getting drunk when things turn dangerous takes real courage!"